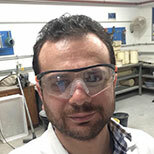 Dr Rabee Shamass is a Lecturer in Civil Engineering in the Division of Civil Engineering and Building Services at London South Bank University (LSBU). Before joined LSBU, he was research assistant at Brunel University London from 2016 to 2017 in the area of composite concrete-steel structures and multi-scale numerical analysis of long flexible risers. He received his PhD in Civil Engineering and his MSc in Advanced Engineering Design from Brunel University London in 2017 and 2011, respectively. Moreover, he received his BSc from Damascus University in the subject of Civil Engineering-Structural Engineering in 2007 followed by one-year further study in Structural and Seismic Engineering at the Higher Institute for Earthquake Research and Studies. Rabee's main research focus lies in the area of structural analysis and sustainable materials in constructions, including testing, theoretical and numerical modelling, and the developments of efficient design guidance. In particular, his expertise lies in the collapse of pipelines, structural behaviour of precast concrete segmental bridge (PCSB), behaviour of composite concrete-steel structures made from either high strength steel or stainless steel beam sections, multi-scale numerical analysis of flexible risers, finite-element modelling using ABAQUS, mechanical and structural behaviour of steel fibres reinforced concrete made from recycled concrete aggregates, structural behaviour of concrete beams/slabs reinforced with basalt FRP bars, and mechanical characteristics of basalt fibres reinforced concrete. His research studies are based on laboratory testing with validated numerical and analytical analysis to suggest design guidance and recommendations for the particular research study. Find Rabee on Researchgate and Linkedin. Rabee is engaging in teaching at both undergraduate and postgraduate level. The Modules that Rabee teaches are Structures and Construction Technology, Mathematics, Construction Practice (Revit and AutoCad), and Finite-element and Stress Analysis. Furthermore, he supervises undergraduate and postgraduate projects. Steel fibres reinforced concrete and basalt fibres reinforced concrete. Shamass, R and Cashell, KA Bending Moment Capacity of Stainless Steel-Concrete Composite Beams. In: 12th International Conference on Advances in Steel-Concrete Composite Structures (ASCCS 2018), 27 June 2018 - 29 June 2018, Valencia-Spain. Sejkati, E and Zhou, X and Mancini, M and Shamass, R Modelling post-tensioned precast concrete segmental girder bridges with dry keyed joints – preliminary results. In: 9th International Concrete Conference 2016: Environment, Efficiency and Economic Challenges for Concrete, 04 July - 06 July 2016, Dundee, Scotland. Shamass, R and Alfano, G and Guarracino, F On the elasto-plastic stability analysis of circular cylindrical shells. In: The International Colloquium On Stability And Ductility Of Steel Structures – SDSS 2016, 30 May - 1 June 2016, Timisoara, Romania.